Traptex® is a high quality synthetic fiber bunker lining material having excellent drainage and sand retention capabilities with enhanced UV resistance. The product demonstrates superior compressed thickness below moderate sand depths and in prolonged wet conditions. The unique characteristics of the material derive from the dual-locking process employed by Fiber Bond during its manufacture wherein the fibers are both needle punched (mechanically entangled) and resin-bonded to form a strong and durable material. TrapTex® HRN 0.90 inches 78.75″ x 82′ Composite liner. High flow. Mesh Top vs. Raking. TrapTex® HRN is a high quality synthetic fiber bunker lining material having excellent drainage & sand retention capabilities with enhanced UV resistance. The product features a 22×18 polyester reinforcement mesh layer adhered to the upper surface. The product demonstrates superior compressed thickness below moderate sand depths & in wet conditions. Roll Weight: 54 pounds, approx. TrapTex® HR is a highly U.V. resistant, high quality synthetic fiber bunker lining material having excellent drainage and sand retention capabilities. The product demonstrates superior compressed thickness below moderate sand depths and in wet conditions. Roll Weight: 56 pounds, approx. 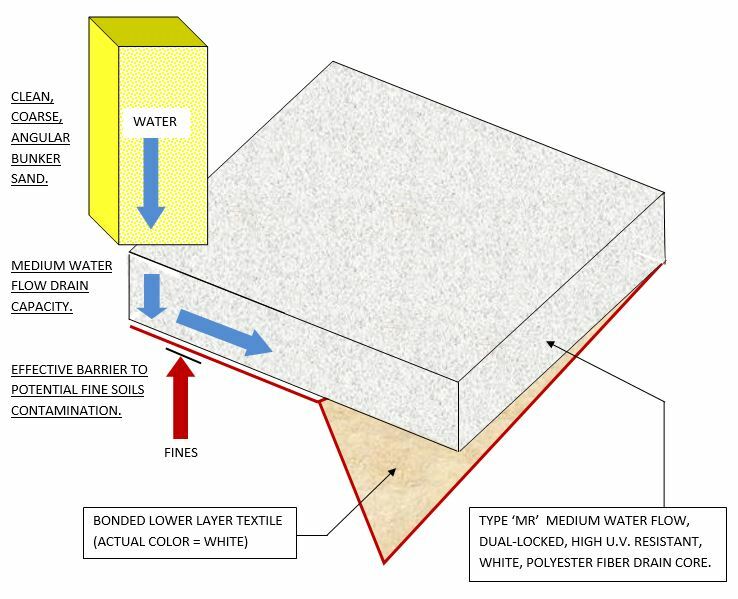 TrapTex® MXR is a high quality synthetic fiber bunker lining material having excellent drainage and sand retention capabilities with enhanced UV resistance. 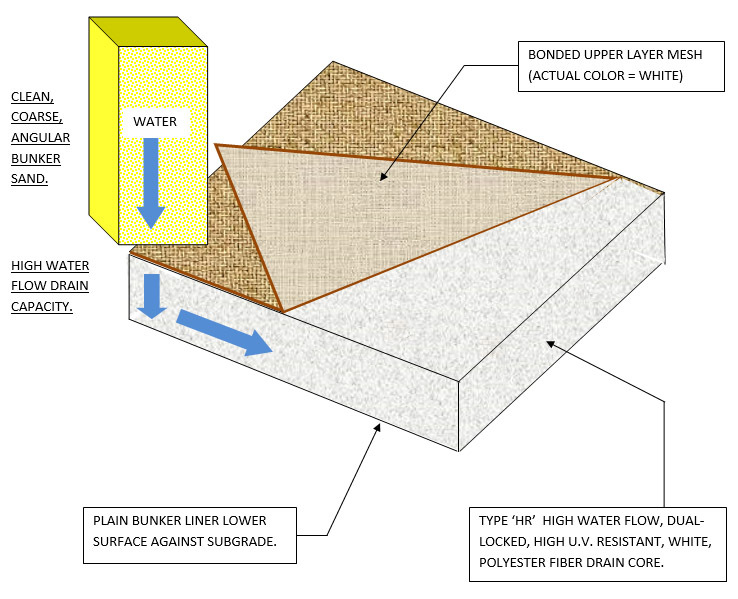 The product demonstrates superior compressed thickness below moderate sand depths and in prolonged wet conditions. Well suited to tropical climates & rainfalls. Roll Weight: 70 pounds, approx. TrapTex® MR is a highly U.V. resistant, high quality synthetic fiber bunker lining material having excellent drainage and sand retention capabilities. The product demonstrates superior compressed thickness below moderate sand depths and in prolonged wet conditions. Roll Weight: 74 pounds, approx. TrapTex® LR is a highly U.V. resistant, high quality synthetic fiber bunker lining material having excellent sand retention capabilities. The product will provide some drainage enhancement but is primarily intended to prevent sand contamination. Roll Weight: 65 pounds, approx. TrapTex® BDL is a high quality synthetic fiber bunker drain lining material having excellent drainage capabilities with enhanced UV resistance. The product will provide adequate separation capability between drainage gravel and bunker sand layers. Permeability (initial-estimated) 14,000 inches / hour Equivalent to “well sorted gravel”. Permeability (long term) 140 inches / hour Equivalent to “well sorted sand”. Roll Diameter: 32 inches approx. Roll Weight: 12 lbs. approx. For use with TrapTex® Flexible Textile Bunker Liners And StrataPath Turf Protection Mats.